If you are about to choose a surgical procedure for obesity either yourself or your relation, it is essential to be aware of the pros and cons of these surgeries before making a final decision. Gastric bypass surgery and gastric sleeve surgeries are the two most common weight loss surgeries in the United States. While both are performed for obese patients to achieve weight loss, they differ regarding the mechanism of action, cost, expected weight loss, reversal of comorbid conditions, rapidity of weight loss, and complication profile. 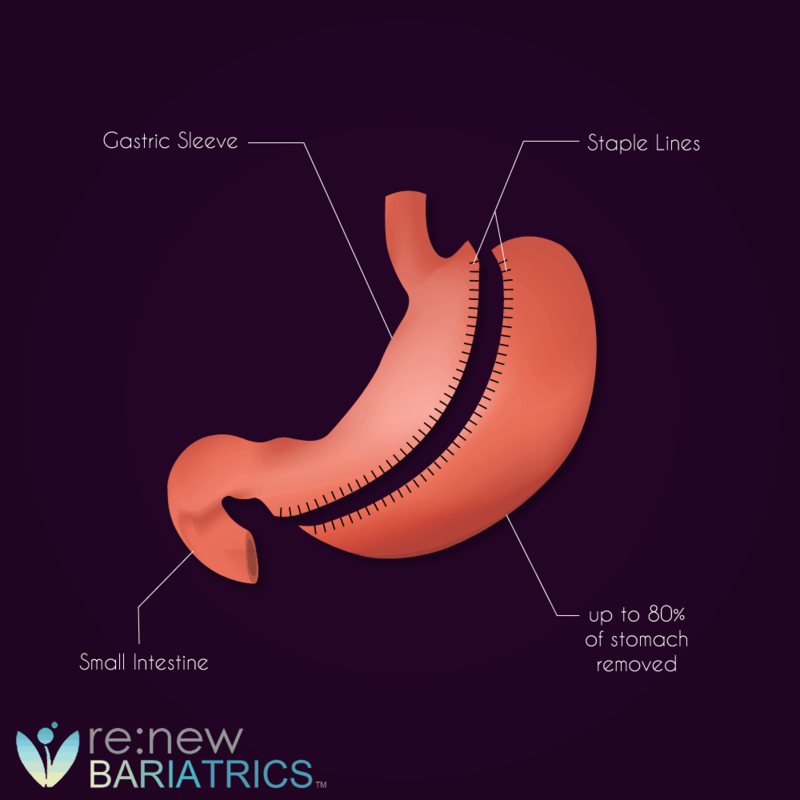 Renew Bariatrics recommends Gastric Sleeve Surgery for a majority of reasons, primarily that it provides sufficient expected weight loss, without high rates of complications or side effects. Interested in undergoing Tijuana Mexico Gastric Sleeve Surgery? Please contact our helpful, knowledgeable patient educators who can help guide you through the entire process of getting approved for the gastric sleeve surgery in Tijuana, or Cancun. Bariatric surgeries induce weight loss by reducing the quantity of food intake (restrictive) or absorption (malabsorptive) or both. Gastric bypass is both restrictive and malabsorptive as the stomach capacity is reduced by creating a small pouch and bypassing the larger portion while absorption is reduced by refashioning the small intestine. The gastric sleeve, on the other hand, is purely restrictive as 80-90% of the stomach is resected (cut), leaving a banana-shaped 10% that accommodates the only small amount of food. Both gastric bypass and gastric sleeve surgery can be done by either open surgery or by laparoscopy. Laparoscopic surgery is a minimal access surgery where small incisions (like holes) are created in the abdomen to facilitate the entry of equipment with the camera. It reduces the perioperative complications and accelerates recovery time. Thus, the laparoscopic approach is currently being favored. 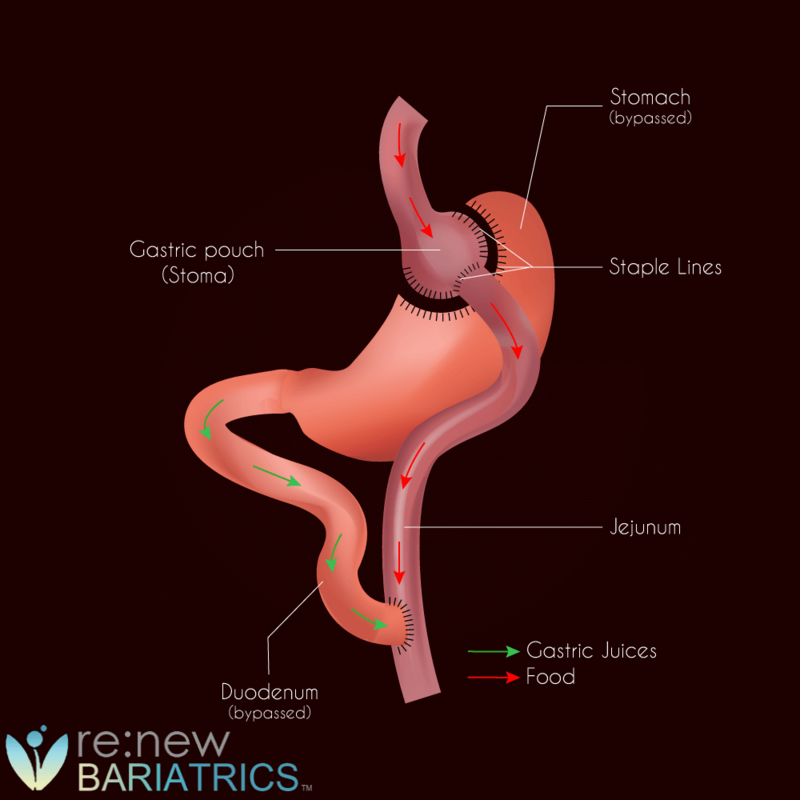 Renew Bariatrics currently only performs Laparoscopic Gastric Sleeve and Laparoscopic Gastric Bypass. The duration of gastric bypass procedure is longer than that of gastric sleeve surgery (130min vs. 100min). Patients tend to stay more in the hospital after gastric bypass than gastric sleeve surgery, though the difference is not more than a day. In the United States, the average cost of gastric bypass surgery is $21,000 ($17,000-$30,000) while that of gastric sleeve surgery is $15,000 ($12,000-$20,000). Up to 50% reduction cost may be obtained outside the U.S. Cost also varies from one hospital to another. However, the most important consideration should be the competency of the surgeon as this has been shown to influence the outcome of the surgery. Both procedures are covered by insurance, though requirements for approval slightly differ. The results of bariatric surgeries are often measured by the percentage of excess weight loss, the degree of improvement/resolution of comorbid conditions, the risks of complications and the risk of death. Gastric bypass surgery patients are expected to lose up to 70% of the excess weight, while those with gastric sleeve surgery will lose an average of 59% of the excess weight. These are usually achieved within 12-18 months after surgery. What is most important however is the sustainability of the weight loss over an extended period which is almost equal to both operations (average of 50% of the excess weight loss at 10 years). Both gastric bypass and gastric sleeve surgery lead to improvement or complete resolution of comorbid conditions such as hypertension, diabetes mellitus, sleep apnea, osteoarthritis, etc. Lager et al. revealed that gastric bypass patients recorded higher reduction in systolic blood pressure than patients with gastric sleeve surgery (12.8mmHg vs. 11.0mmHg) at 2 years after surgery. Li et al. in the review of many studies also reported more resolution and a superior improvement in type 2 diabetes mellitus in patients who underwent gastric bypass surgery over those who had gastric sleeve surgery. Gastric bypass patients also had a greater reduction in harmful lipids than gastric sleeve patients. Gastric bypass surgery has been shown by many studies to have a higher risk of complications than gastric sleeve surgery (10.2% vs. 3.5%),  (8% vs. 4.2%). Complications such as bleeding, leakage from staple line are common to both surgeries. Dumping syndrome, anastomotic stricture, and intestinal obstruction occur after gastric bypass surgery and very rarely with gastric sleeve. However, heartburn from gastro-esophageal reflux disease (GERD) is majorly seen after gastric sleeve surgery, and patients with heartburn before surgery are often advised to go for gastric bypass surgery. Nutritional deficiencies can occur in both procedures but more with gastric bypass surgery as it is both restrictive and malabsorptive. The overall risk of death after bariatric surgery is extremely low (0.3%), it is however slightly higher after gastric bypass surgery. In conclusion, both gastric bypass and gastric sleeve surgeries are effective bariatric surgeries. While gastric bypass offers a slightly higher weight loss and reversal of comorbid conditions, it is expensive and associated with higher risk of complications. The gastric sleeve, on the other hand, is cheaper with a lower risk of complications and death. Park JY, Kim YJ. Laparoscopic gastric bypass vs. sleeve gastrectomy in obese Korean patients. World Journal of Gastroenterology. 2015;21(44):12612-12619. doi:10.3748/wjg.v21.i44.12612. McGrice M, Don Paul K. Interventions to improve long-term weight loss in patients following bariatric surgery: challenges and solutions. Diabetes, Metabolic Syndrome, and Obesity: Targets and Therapy. 2015;8:263-274. doi:10.2147/DMSO.S57054. Lager CJ, Esfandiari NH, Subauste AR, et al. Roux-En-Y Gastric Bypass Vs. Sleeve Gastrectomy: Balancing the Risks of Surgery with the Benefits of Weight Loss. Obesity Surgery. 2017;27(1):154-161. doi:10.1007/s11695-016-2265-2. Li J-F, Lai D-D, Ni B, Sun K-X. Comparison of laparoscopic Roux-en-Y gastric bypass with laparoscopic sleeve gastrectomy for morbid obesity or type 2 diabetes mellitus: a meta-analysis of randomized controlled trials. Canadian Journal of Surgery. 2013;56(6):E158-E164. doi:10.1503/cjs.026912. Barzin M, Khalaj A, Motamedi MA, Shapoori P, Azizi F, Hosseinpanah F. Safety and effectiveness of sleeve gastrectomy versus gastric bypass: one-year results of Tehran Obesity Treatment Study (TOTS). Gastroenterology and Hepatology From Bed to Bench. 2016;9(Suppl1):S62-S69. Smith MD, Patterson E, Wahed AS, et al. 30-day Mortality after Bariatric Surgery: Independently Adjudicated Causes of Death in the Longitudinal Assessment of Bariatric Surgery. Obesity surgery. 2011;21(11):1687-1692. doi:10.1007/s11695-011-0497-8. Please contact our helpful, knowledgeable patient educators who can help guide you through the entire process of getting approved for the gastric sleeve surgery in Mexico.